Some dolls are not meant to be played with. Eight year old Brooke Connor had a problem. She wasn't afraid of the dark or the boogie monster in the closet. She'd certainly outgrown that plus the fear of the boogey man certainly wasn't a fear of hers. After all since her seventh birthday she had something to be afraid of that was indeed real. On her seventh birthday her grandmother gave her five dolls she said were made in India. At 11PM on the night of her seventh birthday the heads of all five dolls came off and started flying around the room. She yelled for her mom but the heads of the dolls got back on the dolls bodies before her mom arrived. When Brooke told her mom Doris what happened Doris said "you're too old to believe in monsters and things like that now go to bed." Brooke knew there was nothing she could do. The next day she told her classmates in school and said she'd arrange for them to spend the night over the weekend if they didn't believe her. The teacher was offended and sent her to the principal. When her mother came up to the school she was upset. The principal suggested she be psychologically evaluated but Doris said "oh no she's just a kid telling fibs." For six months Brooke had no friends at school. After she finally made friends she felt better. 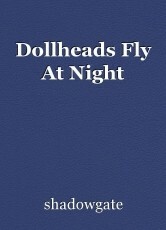 But every night since her seventh birthday she's had to deal with the doll heads flying on their own. But a week after her eighth birthday she went and made a proposition to her best friend Alice Franklin also eight years old. "Alice do you remember when I got in big trouble for claiming that five of my dolls had heads that flew off at night?" Alice said "yes I do." Brooke said "well you're spending the night with me tonight so you'll see for yourself." Alice said "oh Brooke cut out the garbage." Brooke said "if I'm lying I'll give you this $50 bill. You're spending the night with me regardless so this could be an easy $50 for you. They start flying at either 10 or 11 so tonight you'll see." Brooke said "don't back out on me now. You're my best friend and I need you tonight." Alice said "yeah I won't back out because you're my best friend even if you're telling a stupid lie." Brooke was irritated by the "stupid lie" remark but none the less Alice showed up. Alice said right when she showed up "I'll expect that $50 in the morning." Brooke said "if I'm wrong you get it for sure." The girls ate Pizza Hut, played video games, and watched the movie Poltergeist. Before they knew it bedtime came. At 10:30 PM the doll heads started to fly. Alice yelled "Oh my God!" Brooke said "now you believe me." Alice asked "Where did you get these dolls?" Brooke said "my grandma gave them to me for my seventh birthday and said they were from India." Alice asked "why didn't you just get rid of them?" Brooke replied "that's a good question." When Doris came upstairs and opened the door she said "girls I" but was cut off when she saw the doll heads flying around the room. Doris yelled "What on earth Brooke?" Brooke said "I told you mother." Alice yelled "It looks like your mom and I both owe you an apology and you owe me nothing at all!"